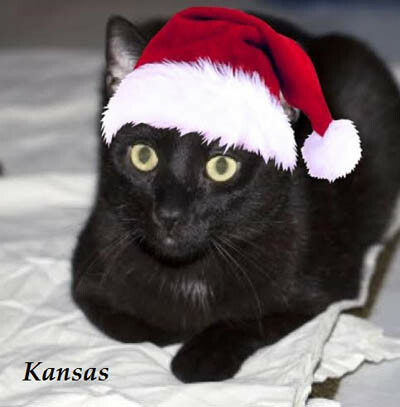 Kansas is our ambassador – he is wonderful with other cats and always takes the time to make the other kitty feel at home and make new kitty friends. He doesn’t forget people either! 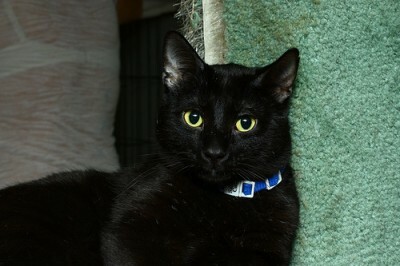 Kansas is a gorgeous, talkative all-black cat. If you’re not careful, he’ll jump right up in your lap and won’t leave until he’s done getting pets and kisses. 2015-12-16: Lucky Mr. Kansas found his forever home, with the brother of the founder of the shelter! The cheerful and gregarious boy now gets to live his life out in comfort, and with a truly caring family, who will keep him healthy and happy for the rest of his days.